The Mozilla India Planning Meetup was organized on 9th and 10th of July 2016 at Pune. 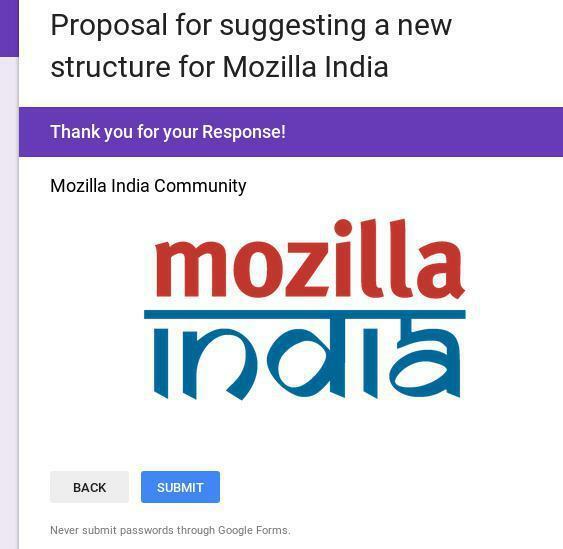 One of the major outcomes from the meeting is to engage the Mozilla India community on the structures we should put in place for our community moving forward. (b) comments on other people’s submissions. established years ago when the community was much smaller and very different, and so with the growth of Mozilla India and emergence of strong sub-communities in different parts of the country, we need to get to an updated structure in order to have the impact we all want moving forward, including bringing value to individual Mozillians. The new structure would be made public on 21st August in advance of a larger Mozilla India gathering on August 26-28. Your identity is kept anonymous. You can draft the proposal in an Etherpad and can share the link of the same in the Proposal area. To facilitate the restructure process, a working group of 5 people has been formed. Make the proposals/suggestions public and open for the community to review and comment. Process, analyze and integrate the suggestions and comments. Decide on the finalized structure. If I put a URL in the suggestion box, can I update the content later? Are you going to copy the content from inside the URL after the submission last date or as soon as I submit? Erm, why is there a thank you message before the form is even submitted? It’s highly misleading.